May 22d we moved three miles further down the levee and camped. We never could understand why we should be kept retreating before an enemy that we could thrash whenever we turned on him. The retreat from Alexandria was characterized by some hard fighting, and the rebels got the worst of it every time, and we did not lose a dollar's worth of material. We lost some men in battle but the enemy lost many more. If Gen. Banks managed this retreat he deserves great credit. The Red River expedition was now ended and was failure. Whose fault was it? Let us be charitable in our utterances until the military adept discovers. On the evening of May 22d, we put up our shelter tents a mile from the river at the edge of the forest. There was plenty of shade, but the breeze was cut off which made it awful sultry at times. Brush was brought into camp and screens built to shut out the scorching rays of the sun that often sent the mercury up to 100 degrees in the shade. Notwithstanding the enervating heat, camp exercises and guard duties went on with characteristic military promptness. Our mails could again reach us with some kind of regularity, and give the boys other things to discuss than those by which they were surrounded. 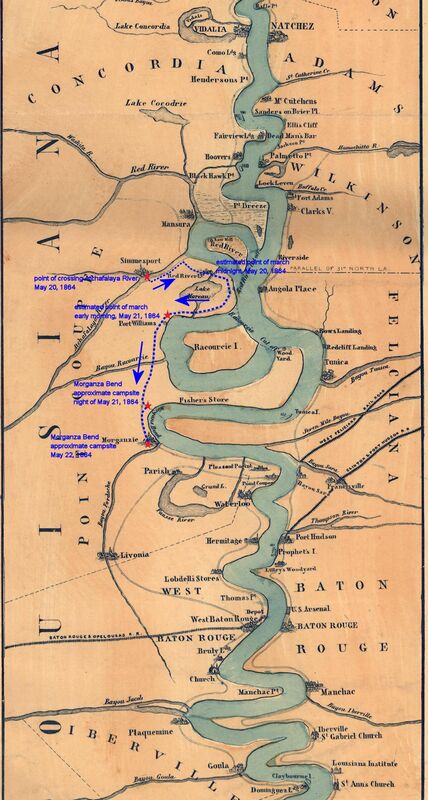 This period military map shows the approximate route taken by the 16th Ohio and other troops under Gen. Nathaniel Banks as they crossed the Atchafalaya River and moved east and south toward a campsite at Morganza Bend, Louisiana. 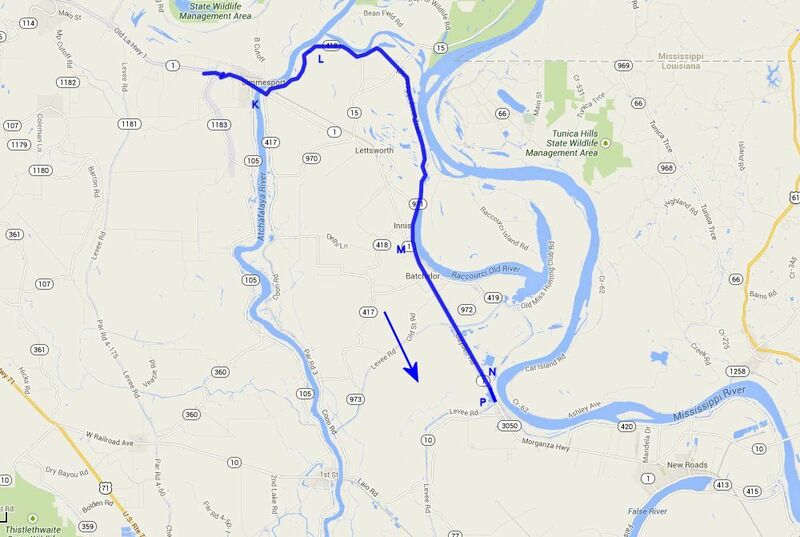 Modern day close view map showing the approximate route taken by the 16th Ohio and other troops under Gen. Nathaniel Banks as they crossed the Atchafalaya River and moved east and south toward a campsite at Morganza Bend, Louisiana. K - Location of the steamboat bridge where the 16th Ohio and all of Gen. Nathaniel Banks' troops crossed the Atchafalaya River on May 20, 1864. L - Estimated location of the 16th Ohio at midnight on May 20, 1864, on its all night march toward the Mississippi River. M - Estimated location of the 16th Ohio on the morning of May 21, 1864, after its all night march toward the Mississippi River. N - Estimated location of the 16th Ohio late in the day on May 21, 1864, when it set up camp near Morganza Bend, Louisiana, on the Mississippi River. P - Estimated location of the 16th Ohio campsite on May 22, 1864, when it moved its camp three miles further downstream near Morganza Bend, Louisiana, on the Mississippi River.